KATHMANDU, Jan 22: The government has not shown any interest in addressing the demands of Dr Govinda KC even on the 13th day of his 16th fast-unto-death. Prime Minister KP Sharma Oli has already left Nepal for Switzerland to take part in an international program while Deputy Prime Minister, and Health and Population Minister Upendra Yadav claimed on Monday that 99 percent of Dr KC’s demands had been addressed. Minister Yadav downplayed Dr KC’s demands while addressing an interaction organized in the capital on Monday. Likewise, Minister for Education, Science and Technology Giriraj Mani Pokharel, too, is not interested in talking about Dr KC’s demands. Minister Pokharel was unavailable despite repeated attempts by Republica to contact him on his cell phone on Monday evening for comments. The Medical Education Bill tabled in parliament by the Education and Health Committee was scheduled to be discussed in the House on Monday. But the House meeting was postponed due to obstructions from the main opposition party, the Nepali Congress, which has demanded that Dr KC’s demands be addressed and the cabinet decision to remove BP Koirala Respiratory Hospital, Tanahu and Sushil Koirala Cancer Hospital of Banke from the Federal Government authority be scrapped. Dissatisfied with the parliamentary committee “for preparing a mafia-serving Medical Education Bill”, Dr KC launched his 16th fast-unto-death on January 9 after the government did not fully implement the agreement signed with him on July 26, 2018 during his 15th hunger strike which ended on the 27th day. However, the government has not taken any initiative yet to address the concerns raised by Dr KC, according to the Solidarity for Dr KC Alliance. “The government is far from addressing the demands raised by the agitating doctor,” said engineer Pritam Subedi, a member of the alliance. Meanwhile, the Solidarity for Dr KC Alliance organized a candlelight protest at New Baneshwar Monday evening to press the government for implementing the last agreement signed with Dr KC. The alliance had also hit the streets of Kathmandu on Saturday in support of Dr KC. Meanwhile, Dr KC was shifted on Monday evening to the Ganeshman Singh Memorial Building of IOM, where he has staged a series of hunger strikes so far. 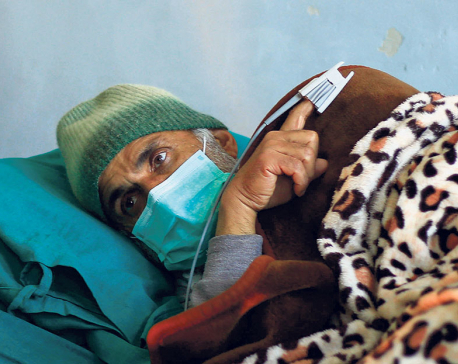 Dr KC, who was admitted to the intensive care unit (ICU) of Tribhuvan University Teaching Hospital, Maharajgunj on January 18, was transferred to the general ward on January 20. After airlifting him from Ilam to Kathmandu in the midnight of January 18, the government admitted Dr KC to the ICU of TUTH. His health condition is reported to be critical but stable. Dr KC has staged hunger strikes for around 200 days since 2012, demanding reforms in the medical sector. According to the nine-point agreement the government reached with Dr KC on July 26, all his demands should have been addressed within two months. 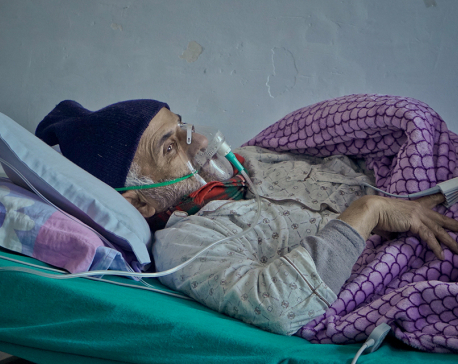 However, the government is yet to honestly implement the agreement signed with Dr KC.